This past weekend we went up to visit my Dad in the deep north woods of Maine. 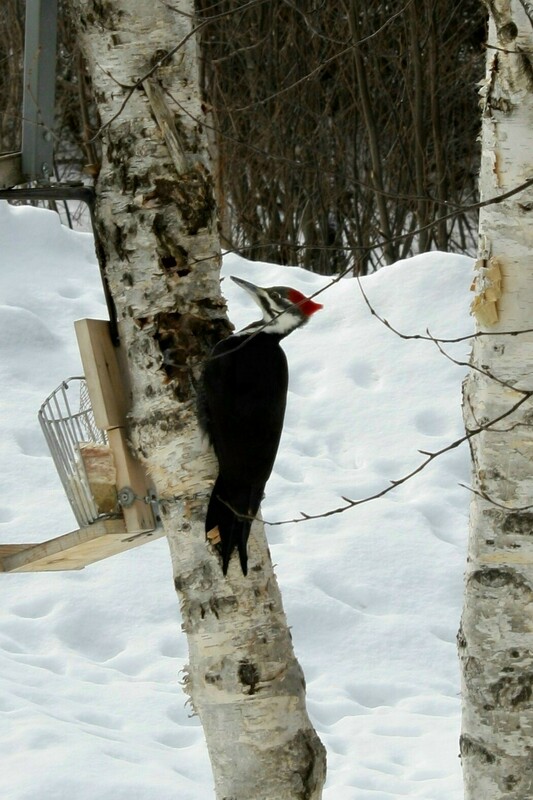 He and my Step-Mom feed a multitude of birds and other critters. 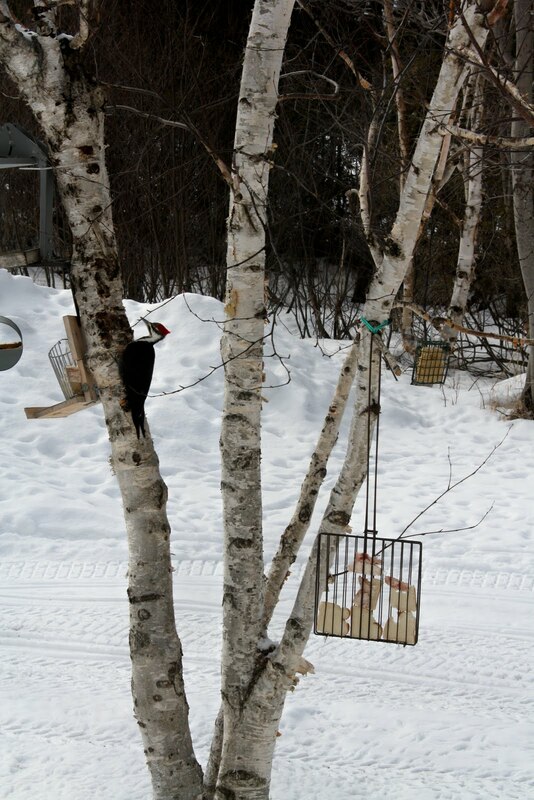 The bird above is a Pileated Woodpecker. The local grocery store gives my Dad all the fat he wants and he saves all his bacon grease and makes food for his feathered friends. He inspired me to make some of my own. If you click on the above picture to enlarge you will get a better view of the feeder I will refer to (top right, green). You can buy suet blocks which usually cost around $1.00 or you can make them. Instead of copying his recipes down I took that lazy way out and took pictures of them. 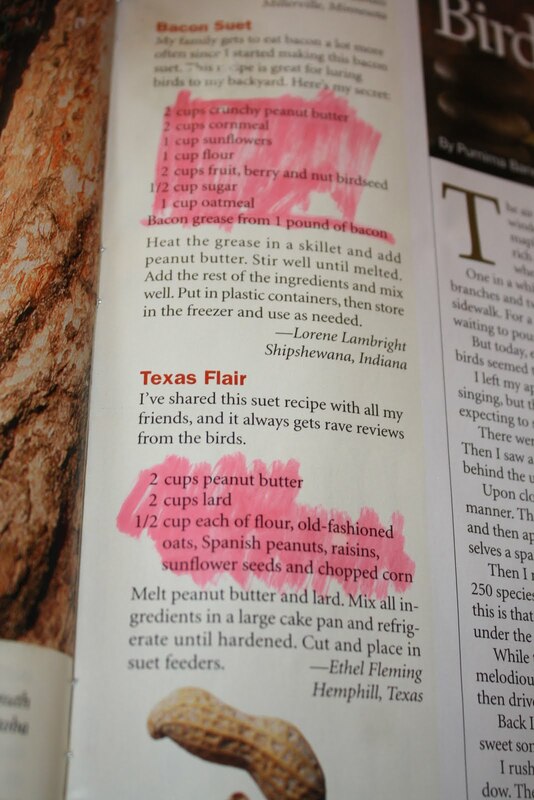 All of these recipes come from issues of Birds N’ Bloom. I had some fat in the freezer that I had planned to make some soap with but instead thought I’d give a try at this. I placed the fat in a crock pot, MM cut it up after it thawed a bit, then I removed the gristle and use the remaining melted fat to make the above recipe. I then packed it down into a cake pan and placed it in the fridge. The next day I cut it into blocks placing one in the feeder and the remaining blocks in the freezer. My Dad saved the molds from previously purchased suet blocks & reuses. That would have been ideal as it makes for a perfect fit but I did not have any. 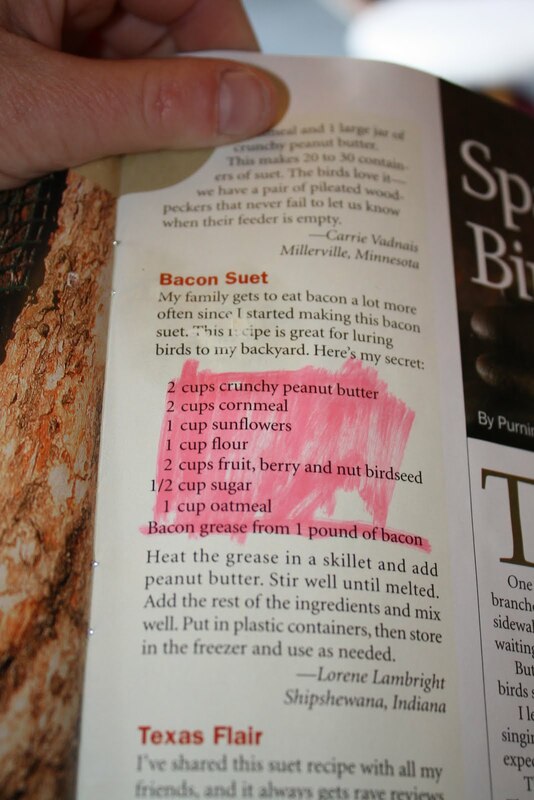 Looking at these recipes you could really just throw together your own version using whatever goods you have on hand as long as the proportions are close. 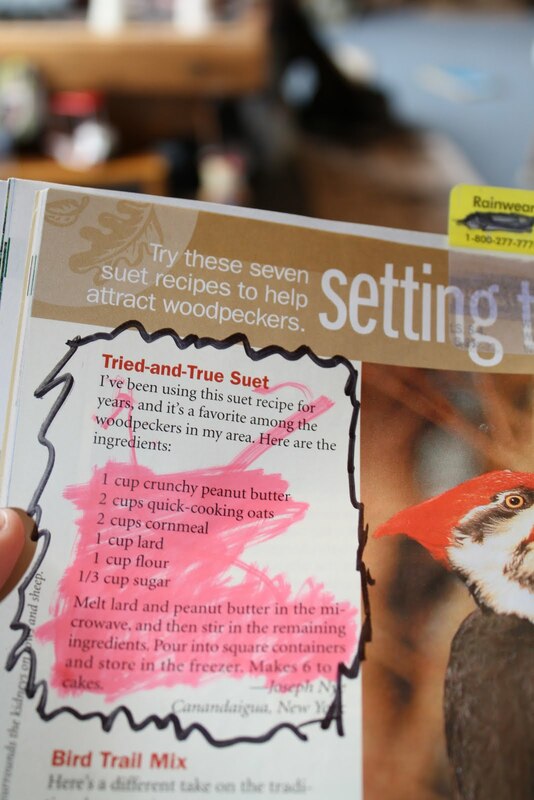 The bird food smelled so good with the blend of peanut butter and oatmeal the kids wanted to eat it. I then had to make peanut butter oatmeal cookies to satisfy the cravings. Had I followed the recipe they may have been edible, instead Barbie & Q (the pigs) enjoyed them. That is the first time I have ever messed up a batch of cookies. 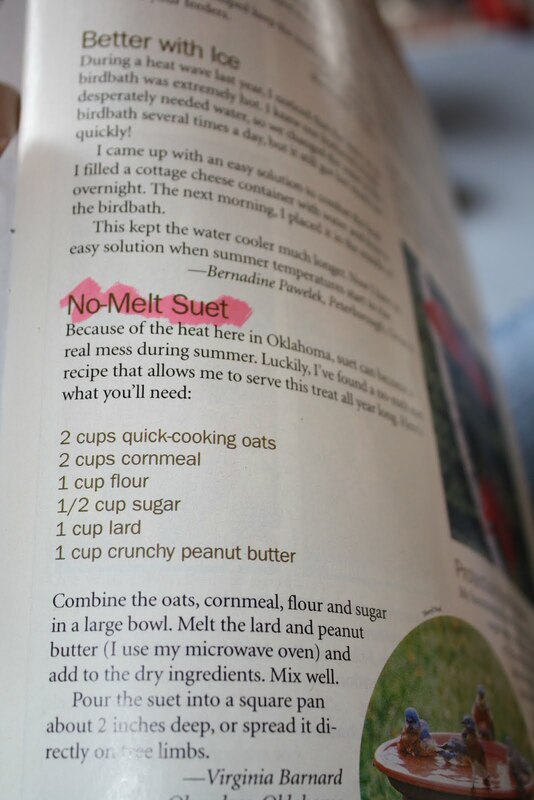 This entry was posted in farm adventures, frugal living, recipe by Achorn Farm. Bookmark the permalink. Enter your email to receive notifications of new posts from Achorn Farm. Kim is a thirty something mom of two kids. Part-time nurse, full time farm girl. Always eager to learn new things! She'll be blogging about I life on a small farm in rural Maine.